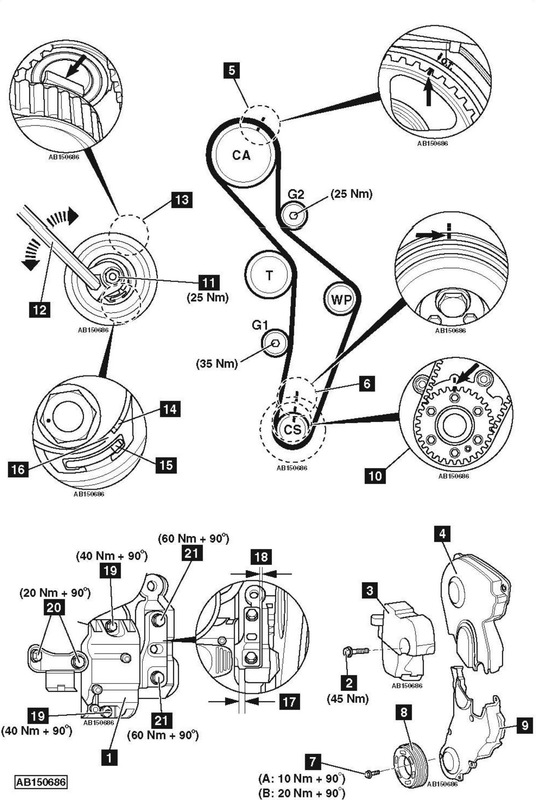 Audi S3 2.0 TFSI 2008 cambelt change instructions and replacement inteval. Full guide! Auxiliary drive belt tensioner locking pin – Audi No.T10060A. RH front inner wing panel. S3: Engine lower torque reaction link. Disconnect fuel vapour hose from evaporative emission (EVAP) canister. Move evaporative emission (EVAP) canister to one side. Remove evaporative emission (EVAP) canister bracket. Disconnect coolant expansion tank multi-plugs. Disconnect coolant hose from timing belt upper cover. Unclip coolant expansion tank lower hose. S3: Windscreen washer reservoir filler neck. Auxiliary drive belt. Use tool No.T10060A. RH engine mounting bracket bolts  . S3: Turbocharger to intercooler pipe. Mark crankshaft sprocket and cylinder block with paint or chalk  . Turn tensioner pulley clockwise away from belt. Use Allen key  . Lightly tighten nut  . Check tensioner pulley and guide pulleys for smooth operation. Replace if necessary. Ensure crankshaft sprocket timing marks aligned  . NOTE: If reusing old belt, observe direction of rotation marks on belt. Ensure belt is taut between sprockets on non-tensioned side. Ensure retaining lug located in slot in cylinder head  . Turn tensioner pulley clockwise until notch  is above lug  in baseplate. Use Allen key  . Turn tensioner pulley clockwise until notch aligned with lug in baseplate  &  . Use Allen key  . Tighten tensioner pulley nut  . Tightening torque: 25 Nm. Turn crankshaft slowly two turns clockwise until timing marks aligned  &  . NOTE: Turn crankshaft last 45° smoothly without stopping. Ensure notch aligned with lug in baseplate  &  . Tighten RH engine mounting bracket bolts  . Tightening torque: 45 Nm. Engine mounting clearance: 16 mm  . Ensure engine mounting aligned parallel with engine mounting bracket  . Engine mounting bolts  . Tightening torque: 40 Nm + 90°. Use new bolts. Engine mounting bolts  . Tightening torque: 20 Nm + 90°. Use new bolts. Engine mounting bolts  . Tightening torque: 60 Nm + 90°. Use new bolts. A – TT: 10 Nm + 90°. B – S3: 20 Nm + 90°.